Stacking people into windowless offices may be a cheap way to run a business, but it certainly takes a bite out of productivity. As most of us can testify, we would prefer the soothing luminescence of diffused sunlight over a static fluorescent din. Fortunately, the Fraunhofer Institute for Industrial Engineering IAO has developed a solution for dreary interior environments – a series of LED panels that mimic the sky indoors. The panels are set into a grid on the ceiling to mimic just about any type of overcast sky, and they can be configured to display a variety of weather conditions. The new lighting system could actually provide an economic boost, as tests show that daylighting improves productivity upwards of 15% (according to the USGBC and UC Davis). The technology is not entirely new — it is much like those LED billboards next to freeways or in sports stadiums where the 50cm by 50cm panels are composed of red, blue, green and white LEDs (interestingly, the white LEDs are more efficient that the colored ones). The technology can create endless lighting effects up to a power of 3,000 lux, and what is new in this design is that there is a diffuser below the LED panels that can scatter the light evenly throughout the room. The design goal is to recreate the dynamic and subtle range of luminosity that our eyes and brains have evolved to. A virtual sky might seem a bit fantastical to some — and at the current price of 1,000 Euros per square meter, it is affordable to few. Since salaries is the largest expense for many companies, as the price comes down and the payback in employee performance materializes we may see this as a real solution for offices which were unfortunately not built with real daylight in mind. Stacking people into windowless offices may be a cheap way to run a business, but it certainly takes a bite out of productivity. As most of us can testify, we would prefer the soothing luminescence of diffused sunlight over a static fluorescent din. 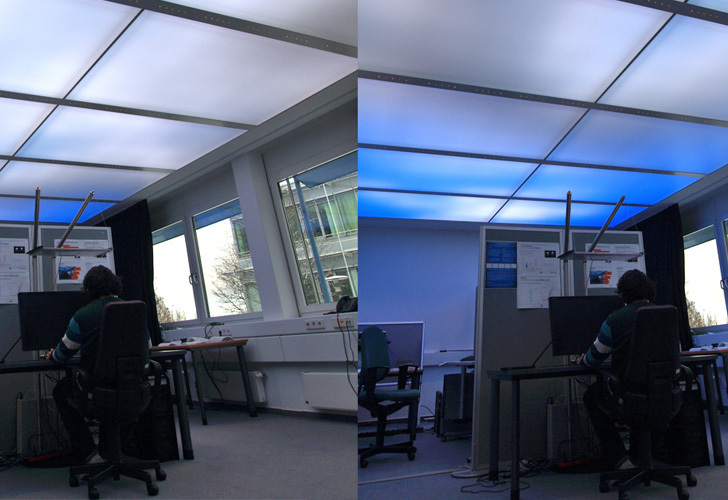 Fortunately, the Fraunhofer Institute for Industrial Engineering IAO has developed a solution for dreary interior environments - a series of LED panels that mimic the sky indoors. The panels are set into a grid on the ceiling to mimic just about any type of overcast sky, and they can be configured to display a variety of weather conditions. The new lighting system could actually provide an economic boost, as tests show that daylighting improves productivity upwards of 15% (according to the USGBC and UC Davis).